The foundation stone for the the Primitive Methodist Church Chapel was laid on 30th September 1873 by Sarah Ann Baker, daughter of George Emery Baker. Mr Baker, founder of the township, had generously given the land on which to erect the building. Prior to this time, church services and Sunday School lessons were held in the residences of Mr Francis Diment and Mr George Baker. 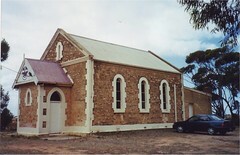 The new chapel was completed and officially opened on 21st December 1873 with Reverend A.W. Wellington as the first minister. In the early years, tea meetings and anniversaries were held regularly, also lectures given on the Monday night following the anniversaries. Church Union between the Wesleyans, Bible Christians and the Primitive Methodists occurred in 1900 and the Methodist Church was formed. In 1910 Mr Cheney's tender of 80 pound 9 shillings and sixpence was accepted to add the front porch to the building. By 1923 inquiries were made re a gas lighting plant and in 1927 an additional light was installed over the rostrum. The Ladies Guild asked to have the boiler reconditioned and the trust agreed to pay the expenses. 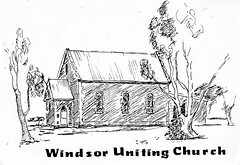 In 1958 a letter was received from the District Council of Mallala requesting the permission of the Windsor Church Trust to close Chapel Street (between the church property and the tennis club property) and transfer the land to the Windsor Tennis Club. Electricity was connected in 1961 two years after the first application was made. A transportable room was purchased for the Sunday School and classes were moved from the back room of the church. In 1967 the church at Dublin closed and services were held only at Windsor following a period of alternating between the two buildings. 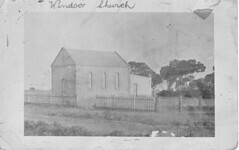 Renovations to the front of the Windsor Church and to the pulpit completly altered the appearance of the interior. 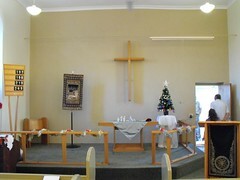 Sunday School classes continued through the years. 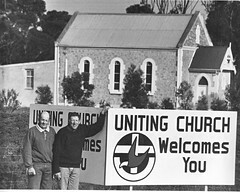 In 1978, the Protestant denominations of Methodist, Prebyterian and Congregational amalgamated and the Uniting Church of Australia was officially born. Ministers to 1985: Reverends Parkinson, Wellington, Edwards, Stephenson, Salmon, Finch, Dingle, Schafer, Mugford, Tresize, Rossiter, Rogers, Jennison, Keipert, Plowes, Ashman, Patrick, Dalton, Albury, Polkinghorne, Dawes, Bray, Stewart, Woodhouse, Saunders, Benn. 1985 - 2011: Reverends Doug Walladge, Lloyd Kerley, Flo Walters, Brian Polkinghorne, Brian Smith, John Watt, Geof Gratz, Pastor Grant Jewell. "Life Around the Light" A history of the Mallala District Council Area. Published in 1985. Mrs Gwen Secomb - Windsor S.A.
Do you remember Windsor Church ? Then Join up and add your memory here.